As some of you will know I report on the space weather regularly when there is something going on…or something might be going on in the hours following the article. 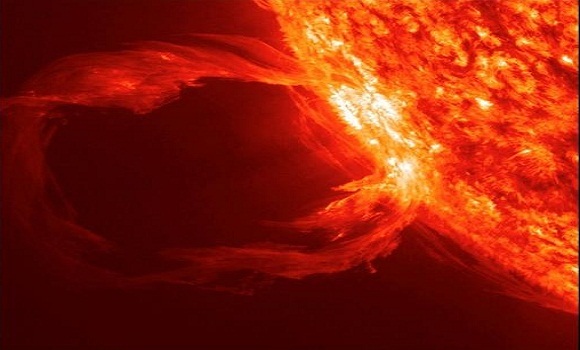 Many readers are asking about a report in the Washington Examiner, which states that a Carrington-class solar storm narrowly missed Earth two weeks ago. There was no Carrington-class solar storm two weeks ago. On the contrary, solar activity was low throughout the month of July. The report is erroneous. The possibility of such a storm is, however, worth thinking about: A modern Carrington event would cause significant damage to our high-tech society. I am all in favor of alerting the public of both the United States and the wider world of any incoming event, but throwing out spurious reports serves no purpose. Some excellent writers from mainstream and alternative media have heard what the ‘experts’ said and went on to write their articles accordingly. I can see why, I almost did the same thing. To have so-called specialists that are on various government committees and panels putting out such erroneous information is, in my opinion, unforgivable. With all of the real EMP near-misses that have occurred in recent years, one has to wonder what would be the motivation behind publicizing a false report. When people supposedly ‘in the know’ spew such drivel it actually has a detrimental effect on preparedness for such a disaster. There have been many cases in the past of tsunami warnings being issued before the full facts are known. The result was that people got used to them and ignored the warnings, leading to many deaths when a large tsunami did arrive. If these are the people that are in charge of warning the public about an incoming EMP God help us. What I’d like to know is why they would put out such information? What’s the point? What has it achieved except to get them ridiculed? Here’s what Jim Woolsey has to say. Whose purpose yours or THEIRS? I should very much like to see us transition to abundant clean energy. Having seen off world craft as a youthful fighter pilot in Vietnam, the best way to over come the great lie, is to infiltrate, expose, and redirect peacefully. Lockheed Martin Skunk Works did something I’ve never seen them do before. They stunningly announced (video http://tinyurl.com/b5ctqgo ) they are engaged in producing a Fusion generator and shooting for 2017 delivery. Fusion — read that “clean fusion,” no radioactive materials impacting downwinders’ associated high levels of illnesses mapped by NIH hard-to-find official maps, of residents living downwind from our nuclear power plants… Leuren Moret http://tinyurl.com/lholfsa . Lockheed says their idea is scalable right down to a 1-meter by 2-meter tank for a truck size, 100-mega watt, (power needs of a 50,000 – 100,000 population city) portable prototype device by 2017 and in full production over the following 10 years. Consider the source, The Skunk Works. These people hold so many secrets that I assume they are the primary recruiting source of scientists entering government service off-the-books and into black-ops. They built the U2, the super fast SR 71, the stealth F117, and who knows what else. So What Is Their Power Generation Idea? ….”it sheds massive magnets in favor of lightweight spherical metal grids which confine the fusing ions with purely electric fields. Also, the concept is ideally suited for direct electric conversion for power at very high efficiencies, eliminating much of the massive radiator required by nuclear fission and standard fusion schemes.”…. Skunk Works is sending a shot across the bow of policy wonks at all levels, just in time for the 2016 US Presidential Election cycle. They would not come out of the den at Skunk Works and speak about anything unless the topic were being given a green light by the unimaginably powerful Black Ops scientific community, and those who run it. This is exactly how big changes become integrated into mainstream commerce. Soft Theory: — The obvious is too obvious — Lockheed is saying we want clean fusion R&D money to develop our prototype. So political parties should talk about this during the next election cycle. Make a political party-plank out of it: “clean energy — clean fusion.” Even the Independent Party can support clean fusion R&D. Lockheed is known for keeping secrets and not known for engaging in public challanges to the most powerful energy cartels known to humankind. This is completely out of character for Lockheed. Some entity inside government is authorizing Lockheed to speak up publicly. Hard Theory: The elite Illuminati cabal is in disarray on multiple fronts as people are awakening to their endless games of human sacrifice through it’s endless wars , environmental destruction, and global depopulation plans and we are breaking off from their peak oil, coal, and nuclear power cartels with all its corruption. So get ready for the next energy paradigm. Likely Theory: Our people at Lockheed already have a working prototype and computerized 3-D model with reliable and most importantly “repeatable performance” which is putting us confidently ahead of the competition and ready to build. We speak of helping the undeveloped world and it can, but do you seriously believe that this technology will not also be used in the developed world as well? Surely we do not need to explain to you what’s at stake? How important is this Lockheed disclosure? I would rate it grerater economically than any of the following: (1) The migration of vacuum tube to micro processor, (2) Film to Digital (3) Copper wire to Fiber Optics. It will be a paradigm shift in the energy sector.